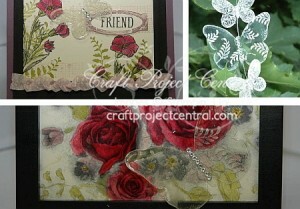 Just Julie B's Stampin' Space: Faux Etched Glass Butterflies! Nothing says warm weather like fluttering butterflies, and these delicate and beautiful “faux etched glass” butterflies will live forever. With just a few Stampin’ Up! products and this simple “Faux Glass Etching” technique, you’ll have enough faux glass butterflies for two home décor projects and an all-occasion card to send to a friend. This would make a fun class or stamp camp project, as well. This pretty project was made by Buffy Cooper and you can get her tutorial when you subscribe to the month of July over at Craft Project Central.